Die Geschichte der Juden Zentralasiens ist lang, ereignisreich und faszinierend. Dennoch sind die so genannten Bucharischen Juden eine der am wenigsten erforschten jüdischen Gemeinden. Der vorliegende Sammelband vereint zwölf englischsprachige Beiträge die sich mit historischen, sprachlichen und anderen identitätsstiftenden Aspekten dieser Diaspora im 20. Jahrhundert befassen. The Jews of Central Asia, commonly known as “Bukharan Jews”, have a long, eventful and fascinating history. Still, until recently this group has attracted very little attention from scholars of either Central Asian or Jewish communities. Only now, that almost no Bukharan Jews are left in Central Asia has their study started seriously. This volume is part of a joint project by teams from Humboldt and Tel Aviv universities and is the first in a series of related publications. Its twelve studies, written by leading authorities, deal with various aspects in the history, language, anthropology, demography and identity of this diaspora group in what proved to be a most important century in their history – a century that radically changed their world and by its end witnessed their mass exodus from Central Asia. The five parts of the volume are grouped in two separate methodological approaches. The first three parts of the volume present innovative studies based on new archival and other sources and are largely written in accordance with the traditional historical approach. Part 1 deals with the burst of optimism and action in the early Soviet Period. Yefim Yakubov’s article describes the temporary government’s abolition of the Tsarist persecution of and limitations on the Bukharan Jews. 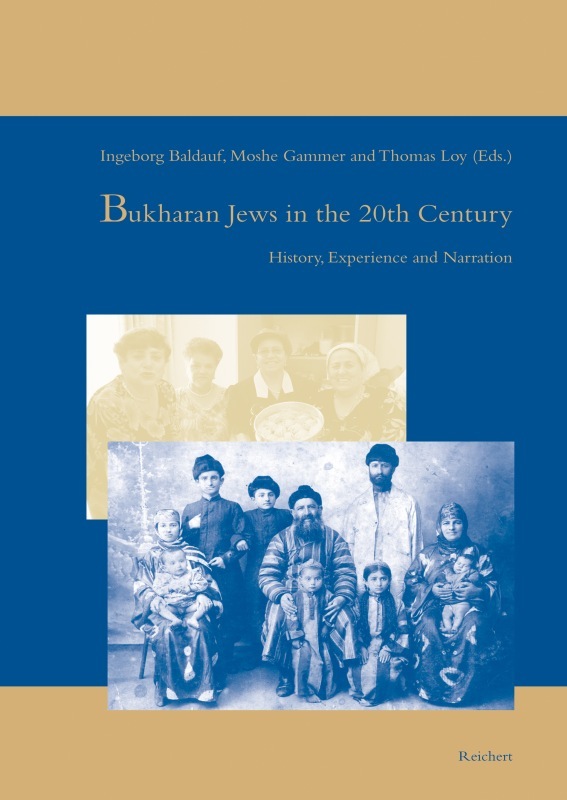 Zeev Levin presents a historical survey of the favourable Soviet policies towards Bukharan Jews in the 1920s and early 1930s and the Bukharan Jewish response to them. Lutz Rzehak describes the efforts to create a literary language for Bukharan Jews and shows how political intentions and transformations affected the language and the linguistic behaviour of Bukharan Jews in Central Asia. The two articles in Part 2 discuss the disillusioned post-Stalin era. Based on Soviet archives and many personal interviews Yaakov Ro’i describes the efforts by the Bukharan Jews to maintain their religious life in the late Soviet Period. Mark Tolts’ paper is the first attempt to explore the demography of the Bukharan Jews in that period. Part 3 moves outside the Soviet Union. Sara Koplik’s chapter, which is based on an array of Western and Jewish archives, details the fate of those Bukharan Jews who fled Soviet Central Asia in the late 1920s and early 1930s. Albert Kaganovitch gives a short survey of Bukharan Jewish communities on three continents at the turn of the 21st century. The last two parts are based on an interview-centred approach common to both oral history and anthropology. The two chapters in Part 4 combine the analysis of oral narration and written memoirs for an investigation into historical memory and interpretation from below. Ingeborg Baldauf focuses on the Gulag memoirs by the Uzbek poet Shukrullo Yusupov, which she understands as an effort to counterbalance state policies on historiography, social memory and the silencing of alternative voices. Thomas Loy’s chapter on Mordekhay Bachayev’s literary memoirs Dar Juvoli Sangin is an attempt to portray this famous Bukharan Jewish writer and his major work in prose. Thomas Loy and Yochai Primak’s chapters in Part 5 are analyses of two major autobiographical narrations recorded during the joint Oral History project on Bukharan Jews. The first deals with a descendent of the Mashhadi Jewish community in Samarkand, the latter focuses on the memories of a female Rabbi in Tel Aviv. Alanna Cooper’s final chapter on courtship and marriage deals with the dynamics of stability and changes in traditions and memories within the Bukharan Jewish community. In: Orientalistische Literaturzeitung 2017; 112(2): 80-81. In: Judaica. 66 (2010) 1.